Removing dissolved oxygen from boiler feed water is absolutely necessary to protect your boiler equipment from severe corrosion. But the make-up water necessary in any boiler system inevitably contains dissolved oxygen. Oxygen can sometimes enter condensate systems as well. A good deaerator is essential to trouble-free boiler operation. Above is a typical "older-style" boiler feed water deaerator.Â You'll see why I call it "older" in a moment. Â The theory here is relatively simple.Â Treated water containing dissolved oxygen is fed onto a contacting device where the water can be heated and contacted with steam which is also fed to the vessel.Â The steam heats the incoming treated water to around 250 Â°F (120 Â°C) and allows oxygen to escape (along with any small amount of uncondensed steam) to the atmosphere.Â Notice that the returning condensate is NOT contacted with the steam in this system.Â Some systems feed the treated water and condensate together to ensure a very low oxygen content.Â Other systems do not bother as the returning condensate is expected to already have a low oxygen content.Â You'll see that newer systems are designed to treat both sources in most cases. 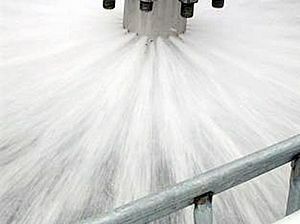 do you know any reference for design criteria of deaerator?